A network-attached storage is essential for data backup and efficient file sharing across the network and different department in most businesses nowadays. QNAP Turbo NAS is an all-in-one file server ideal for data sharing and storage on both internal and external networks. The NAS can be deployed as a central storage server and a backup server with data protection by RAID configuration and secure data transfer with access right control. Turbo NAS is available from 1 to 8 bay models, providing up to 16TB of storage capacity to meet the demand of storage-hungry business, workgroups, and personal users. Users working on different OSes, Windows/ Mac/ Linux/ UNIX can share file via the NAS. The NAS provides FTP service and supports SFTP (Secure File Transfer Protocol) for secure data transfer over the Internet. The IT administrator can create folders, user groups, and users on the NAS with specified read and write access. Domain user accounts and password can be imported to the NAS easily by joining the NAS to an AD domain. This saves the IT effort on account creation and management. Turbo NAS supports RAID 1/ 5/ 6 with hot spare configurations to protect the system from possible data loss caused by hard disk drive failure. Turbo NAS provides excellent data transfer performance of up to 100MB/s via samba. This reduces the waiting time of file upload and download. The dual LAN models offer two Gigabit network interfaces which are capable of load balancing and fault tolerance to maintain high availability of the system and the data. Instant and convenient access to company data is important to business travelers. 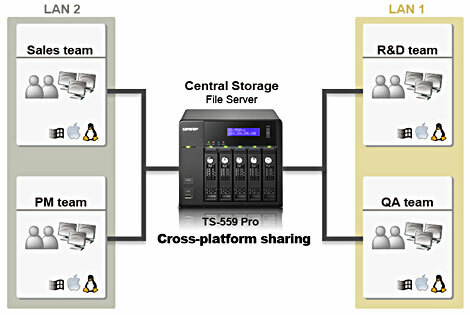 QNAP Turbo NAS offers a variety of services for remote file sharing and access including web-based file access interface, FTP, WebDAV, and DDNS. Business travelers can access the office data on the NAS over the Internet securely without any worry about losing confidential data caused by computer damage or theft during business trips. Turbo NAS provides a web-based interface Web File Manager which allows users to access the files via a web browser over the Internet. To share multimedia files (music, videos, and photos), you can use the web-based Multimedia Station. The system administrator can define the read and write access to the data on the NAS by secure user access management. Turbo NAS is designed with green technology and can run 24/7 with high stability and low power consumption. Connections via HTTPS and FTP with SSL/TLS encryption are supported to allow secure data transfer over the Internet. To access your NAS from the Internet, it is more convenient to use a domain name than to memorize an IP address like 202.193.126.45, especially if you are using a dynamic IP address. Turbo NAS supports DDNS service that you can register a free DDNS domain name for the NAS and access the device by the domain name you specify. You can access the shared contents of other servers on the local and external networks by connecting to one single NAS with the built-in WebDAV service. This service can be used on Windows, Linux, and Mac OSes. Web hosting services are provided for individuals and business users who wish to publish their websites on the Internet. Companies or personal users who have budget concern may not be able to afford the services provided by professional web hosting companies. Discount and free web hosting offers only limited services and space. QNAP Turbo NAS is an affordable and powerful solution capable of offering reliable and easy web hosting with high performance (speed), large storage space, easy management, secure backup, 24/7 services, and extra benefits. Turbo NAS supports built-in web server, database server, MySQL, PHP, JRE, Joomla!, WordPress, multiple websites hosting by virtual host, secure SSL connection, and a lot of free third party web applications. The NAS supports DDNS that you can register unique domain names for your websites for convenient access from the Internet. You can multiple personal blogs, business websites, forums, and online stores on a single server. The NAS also provides printer service, file sharing, FTP service, SSH, and more that you could benefit from all these value-added features. Turbo NAS provides a simple-to-use web-based interface that you can create and maintain your websites with the least effort and professional knowledge required. QNAP NAS is available from 1-bay to 8-bay models offering up to 16TB storage capacity to store your web data. It supports RAID 1/5/5 + hot spare/6/6 + hot spare configurations for data protection. You can back up your website data (Windows, Mac, Linux, or UNIX) from multiple workstations to the NAS. The NAS offers complete backup features such as Time Machine backup from Mac OS, backup to external storage device (eSATA or USB), encrypted remote replication to another QNAP NAS or Rsync server, and backup to online cloud storage. QNAP Turbo NAS is designed to run 24/7 at extremely low power consumption to satisfy the need of business users who require consistent uptime of their websites. The NAS works well with UPS to guarantee uninterrupted services even a power outage occurs. Imagine that you have purchased many software programs in the form of CDs and DVDs, such as MSDN library, for your business. As time goes by, the amount of discs has become huge that you are running out of space to store all of them and it takes effort to browse through all the discs to pick the one you need. The discs may also go through daily tear and wear as they are passed around and shared by different users in the company. QNAP Turbo NAS series is an affordable storage solution for business customers to archive their CDs/DVDs/Blu-ray discs and share them over the network. The ISO Mount function supports both ISO 9660 and UDF disc formats and can mount up to 256 CD, DVD, or Blu-ray discs as ISO share folders. The clients can access the disc data via multiple access protocols such as Samba, FTP, AFP, NFS, Web File Manager, and WebDAV. The mounted ISO share folders on the NAS are protected by read-only access to ensure the contents will not be overwritten or modified. You can specify the users or user groups who are allowed to access the share folders. Furthermore, the NAS can join the Windows Active Directory for convenient account setup and efficient access control. QNAP NAS offers high-speed network data sharing among Windows, Mac, and UNIX/ Linux clients within LAN and across the Internet. The IT administrators and end users can quickly browse and find the specific disc data or software installation utilities, thus increasing work efficiency and productivity. The NAS can also be set up as the backup center of the CD, DVD, and Blu-ray discs to protect the data against disc damage. Symantec Backup Exec is one of the most well-known backup software that delivers reliable data backup and recovery for business. 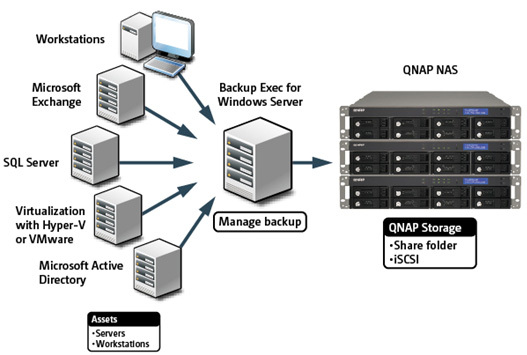 QNAP NAS is an enterprise-class network storage system which works perfectly well with Symantec Backup Exec. 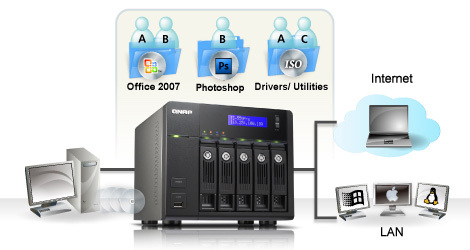 You can set up one or multiple QNAP NAS as the media storage and use it as a full Backup to Disk (B2D) solution. Backup of different operating systems such as Windows with opened files technology, Linux, Mac, and NetWare. Intelligent Disaster Recovery allows you to restore an entire server from a complete disaster in a minimum time. Deduplication helps minimize the size of your backups by eliminating redundant duplicate data. Different agents are available to provide a complete backup system depending on your infrastructure. Microsoft Active Directory agent: Back up and restore your Active Directory for an optimal backup and granular restoration of the Active Directory Objects. Databases backup: Backup Exec support DB2 on Windows server, Microsoft SQL Server, and Oracle. Virtualization environment backup: VMware virtual infrastructures or Microsoft Hyper-V backup agents are available and provide a complete D2D2T backup system (D2D2T: Disk to Disk to Tape). Non-disruptive backup of mail system including Microsoft Exchange or Lotus Domino Server to protect your mail system. Real time workstation protection provided by Desktop Laptop Option (DLO) allows real-time protection of workstations and laptop. Large storage capacity: QNAP NAS supports up to 16 TB of storage capacity (8-bay models). The storage capacity of the server can be expanded by online RAID capacity expansion. RAID data protection: The NAS provides RAID protection to protect your backup data from possible hard disk failure. Easy to deploy and maintain: The NAS can be easily set up and maintained without professional IT knowledge. You can join the NAS to the Active Directory to allow Backup Exec to use the NAS as the backup destination. You can set up SMS and email alert on the NAS for instant error or alert notification. Fast and efficient backup: Keep your existing tape backup system for data archiving, and take the advantages of QNAP NAS as disk storage to store your Backup Exec media. Affordable: QNAP NAS is an affordable network storage solution with enterprise-class server features and performance. Eco-friendly design: QNAP NAS features low power consumption and extremely silent operation. 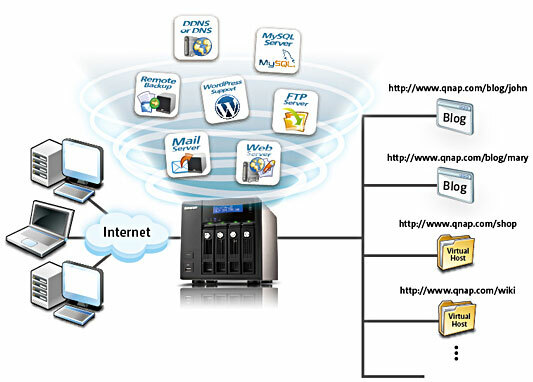 All-in-one server: QNAP NAS provides abundant server applications such as FTP, file server, backup server, web server, and so on.